The laser printer I use for producing PCB artwork for photo exposure is not able to produce accurate results. It is not a 1:1 scale, and it tends to skew as moves through the printer. 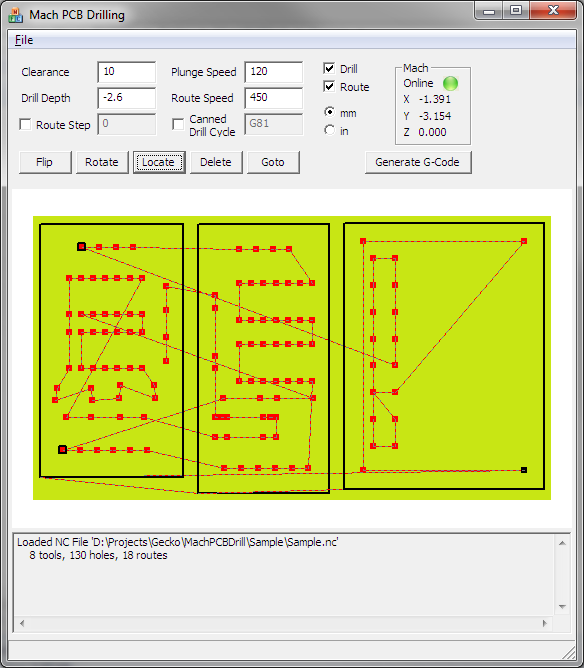 So, I wrote this program that allows me to interactively pick three points on the PCB, then automatically generate corrected GCode for Mach3. Below is a screen grab of the application. The sample NC file in the Sample directory is loaded. Drill Depth How deep to drill to. Route Step Not implemented. This allows for multiple cut levels when routing. Plunge speed The speed the drill bit is plunged into the work piece. The plunge distance is from Clearance to Drill Depth. Route speed The routing speed. Canned Drill Cycle When selected, uses a canned drill cycle, otherwise it uses a combination of G0,G1 commands. Drill When checked, generates GCode for drilling. Route When checked, generates Gcode for routing. mm/in Generates metric (mm) or imperial (in) GCode output. Mach Online When the light is Red, MachPCBDrill is not connected to Mach. When Green, MachPCBDrill is connected to Mach. Rotate Used to match the mounted board to what is displayed. The rotate button will rotate the board 90 degrees. Locate After the tool has been aligned over a hole using Mach, pressing the Locate button will remember the "real" coordinate. After 3 points have been located, GCode can be generated. A located point can be identified by the black outline around the red square. The currently selected hole is a black square. Delete Delete will forget a located hole. Goto After 3 holes have been located, select any hole on the board and select goto. This will tell Mach to move the tool to the hole. Used to double check everything is aligned. Generate G-Code This button generates the G-Code. A temporary file is created (using the system settings, so it should be in the TEMP directory), and automatically loaded into Mach. Mount your PCB on your machine. Theoretically, it can be at any angle (45°? ), but be sensible and keep it to a multiple of 90°. It doesn't need to be accurate, that's what MachPCBDrill is for. Run MachPCBMill. Ensure the Mach Online light is green. If it is not, it usually means there is something wrong with Mach's COM registration. Trying running Mach once as administrator. Use the Flip and Rotate buttons so what you see in MachPCBMill is what you see on your machine's table. Next is the alignment phase. You need to pick 3 points to be used to align the board. Ideally you will pick points that make a large approximate right angle. The further the points are away from each other, the better. When the 3 points have been located, pick another random point in MachPCBDrill and hit the Goto button. Mach will move to the tool to the hole. Confirm it is correctly aligned. Finally, hit the Generate G-Code button. The G-Code is created and loaded into Mach. You are ready to mill! Only metric M48/METRIC,LZ NC files have ever been used. Worse, the files are generated by my own export program, so the metric NC files I use may be non-standard. I've only used metric G-Code output. The program only supports routing straight line segments. Arcs don't work, but it shouldn't be hard to convert them to line segments. The drilling height is from the Clearance height to the Drill Depth. This can make drilling really slow if the clearance height is high. I don't particularly want to support this any more. In the download package, there is a Sample directory, containing a sample PDF circuit, and matching NC drill file. These can be printed on paper and glued to some cardboard or wood to test the program. The source and binary is here .